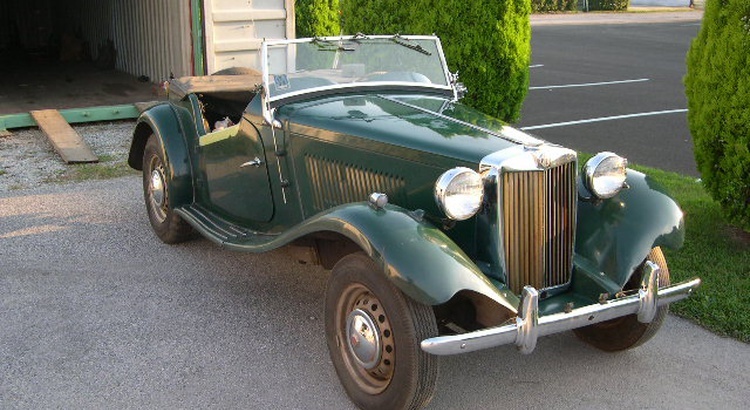 This past July, someone contacted out local MG club asking about selling two MG TDs. The ‘51 had been his dad’s baby, but had thrown a rod in 1964. He bought a ‘53 for it’s donor engine, but never got around to using it. The ‘53 had last been driven in 1966. Since then they both sat squirreled away in the garage, moving with them a couple times. I contacted a friend about buying them and he wanted to go into it together, so that’s what we did. The ‘51 had a large hole in the side of the engine block, had been repainted and had some non-original interior work done to it. The ‘53 “parts car”, however, was very original with 65,000 miles on it. It has the original paint, interior panels, numbers match, but is missing the seats. We sold the ‘51 which is currently being restored, and have the ‘53 for sale. Its originality makes it a very interesting car. Go to http://tinyurl.com/6a25aa for the ‘53 and http://tinyurl.com/5mxbod for the ‘51 You may have to register at Snapfish to view the pics.